Wadi Halfa has grown on me. It is still a searingly hot, dusty, ramshackle, sprawling collection of mud and concrete shacks deposited in the desert a few kilometres from the lake which drowned its original home. It seems even now to be finding its place, and half-built or half-demolished little buildings are thinly scattered across the grey-brown sand between the ‘centre’ – where we go for food when the sun goes down – and our hotel. But the people are what makes this place, and they are unfailingly good all round. The improvement started after finding the fruit and veg market which gave us fresh food to eat – against a background of 2 meals a day and 2 vegan options available in town…ful (cooked brown beans smothered in vegetable oil), or falafel – both with pita bread. Its not even very good beans or falafel. We are losing weight while we wait, despite downing a couple of pints of mango/sugar juice each evening. But small things like fresh tomatoes make a big difference here. 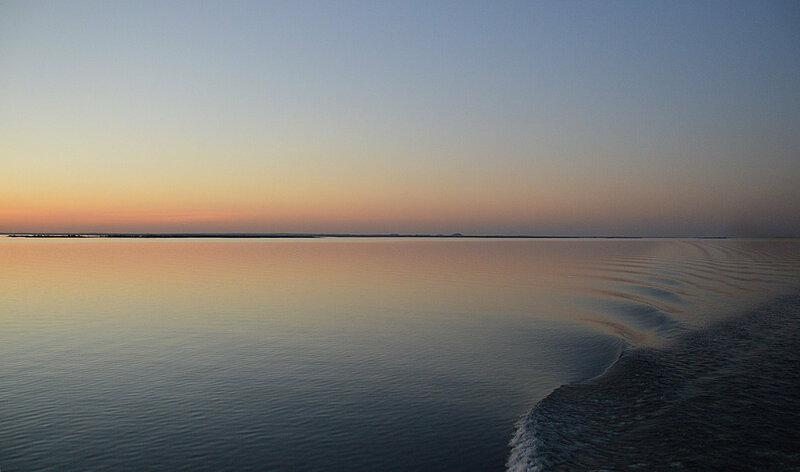 It was all looking good when we boarded the ferry as I had my glass-half-full head on – no crowded stuffy cabin for us, we were given an area of deck by the bridge to sleep in and the front deck to ourselves. There was shade, and some rolled up blankets. Having slept on the deck of a Mediterranean ferry before, this looked like a top sleeping spot to me. It didn’t last. The private deck area (secured by our ‘fixer’ Kamal thanks to a 50 EGP each baksheesh to the captain) was soon invaded by a whole lot of other people…no doubt the further temptation of cash was too much to resist, but it soon turned into a fairly crowded and shrinking shady patch. Then some of the crew turned up and started shouting at us all to move and taking the blankets away…clearly the captain hadn’t let them in on the whole plan to sell their sleeping spot to a bunch of tourists. 18 hours on a hard metal deck was beginning to look like another ordeal to add to the Egyptian Experience so far, and only slightly improved by the kind donation from some other crew of a fleece blanket to sit on. Thinking we were going to be sleeping in a cabin (which we had paid for), we hadn’t brought a lot of stuff out of Troopy onto the boat with us. 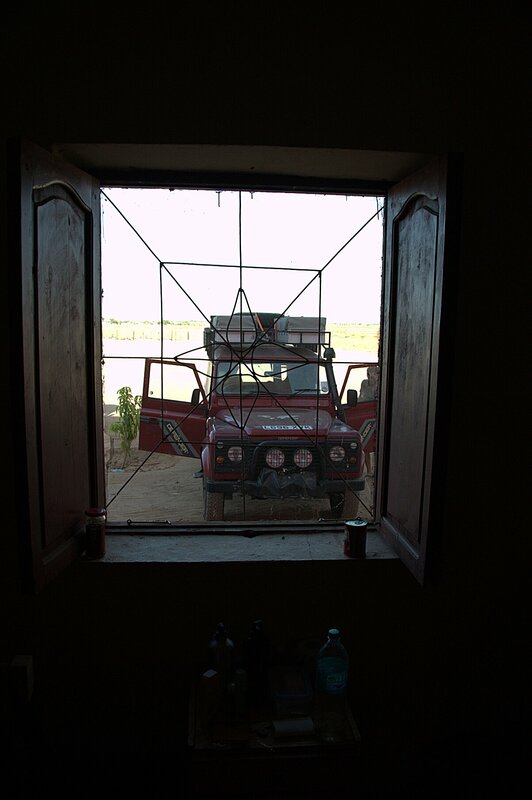 Not bringing a lot of stuff with us was also looking like a strategic error as it became clear that we were going to be sitting in Wadi Halfa for the best part of a week before the barge with Troopy on board turned up. Just a change of clothes, our documents and valuables, and the washbag. But we’re staying in a hotel so thats OK? 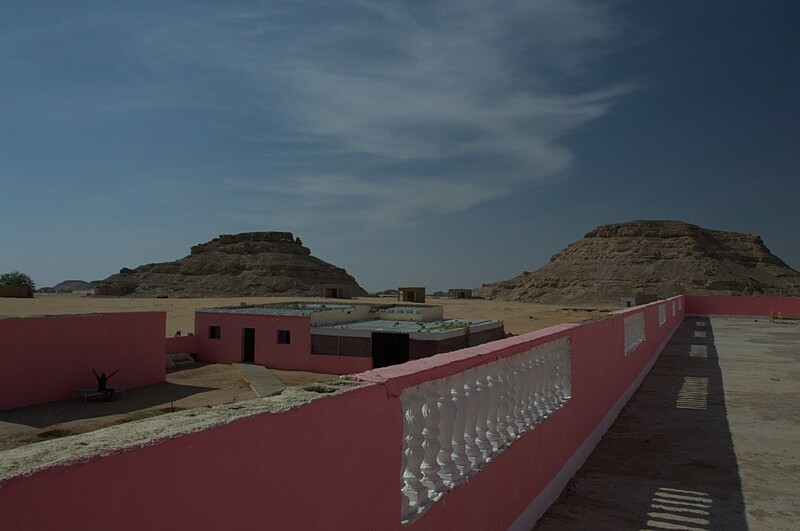 Hmm…well more on the hotel later, but lets just say its short on pretty much everything apart from a basic bed and soaring desert temperatures. 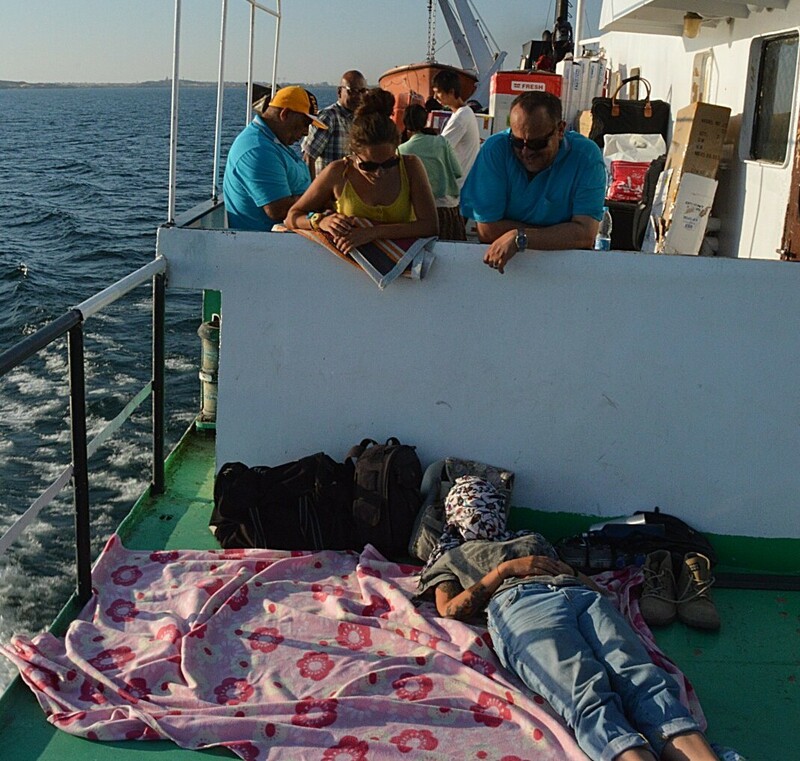 Back on the ferry, we finally set off down Lake Nasser as evening approached, and a cooling breeze made life more pleasant – though Katana was suffering from too much sun exposure (the factor 30 didn’t seem to be helping) and had to hide in the wandering shade and under her scarf. The sunset over the desert and lake was a long, slow transition through colours I wouldn’t know how to name as the light shrunk back through a diminishing letterbox in the West. The toilets down below were avoided as long as possible – in the dark with no lights, and flooding the floor whenever flushed, it was not a place for the squeamish…or those with any sense of smell. We tried to sleep, with people climbing over and stepping on us, or coming to letch at the blond girl, or drop cigarette ash on us. I gave up for a while and sat watching the stars and the smooth water of the lake passing by – figuring I’d take the first night watch to make sure nothing happened to us or our possessions – but had to lie down again after a bit to defend my sleeping space. In the early hours, Katana was woken shivering in the chilling breeze, but fortunately there was enough blanket available to roll her up and leave me a bit to lie on (there’s never been much fat on my bones, but I’m all out of padding after the last month in the desert, so that thin fleece was a sanity saver!). We got some much needed but bruising sleep. 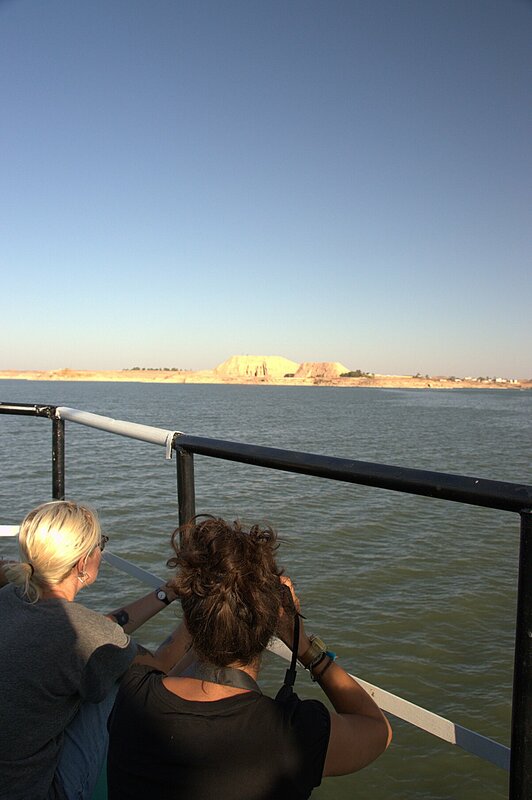 In the morning we passed close by Abu Simbel – where temples rescued from the flooding of the lake have been recreated. And where there are some relatively new ferries bought to serve the short crossing here as part of the ‘new’ road route to Sudan. I don’t know how many years they have been there, but the completed road still shows no sign of opening and avoiding the need for this whole episode in getting from Egypt to Sudan. They lie moored up and rusting, waiting for the Egyptian army to agree to the road being opened. 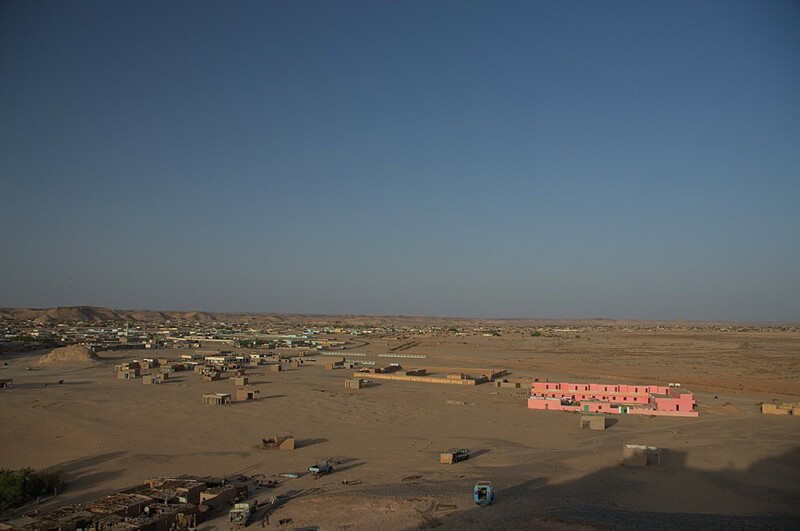 Eventually we arrived in Wadi Halfa and the difference from arrival in Egypt was massive and in a very good way. We were met by Mazar, the local ‘fixer’ who was able to guide us through all the form filling and expedite our passage through customs, then take us into town in one of the numerous and ancient Land Rover taxis where we were delivered to our hotel. Unfortunately for us, used to air conditioning and plentiful water, things here are a bit different. Our room was a basic box with a shuttered window with no glass, just a torn mosquito net and bars. The best they could do for cooling was a squeaky, wobbling ceiling fan which we dare not put above medium speed for fear of bringing the ceiling down. The view from our cell as Tony prepares to escape. We slept at night on top of the single sheets, and merged into the sagging foam ‘mattress’. A brief window of operable temperature in the morning allowed for a breakfast coffee, before a day of hiding in the room with doors and windows open to catch any light air movement, sweating into our beds waiting for the sun to go down. 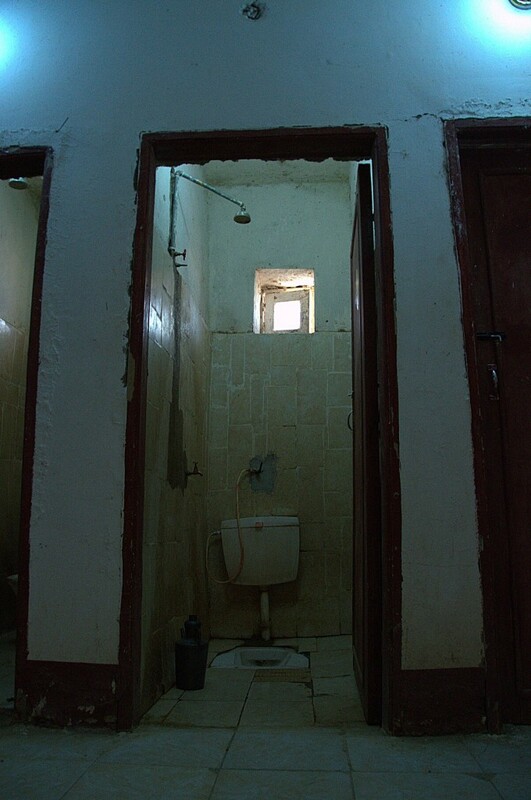 The facilities consisted of dilapidated cubicles at the end of the corridor, each combining a squat toilet and bare shower head…efficient I guess, everything in 1 place. I even wash my 1 set of clothes each morning at the same time. Frogs hop in and out of the cubicles and venture up the corridor at night. After about 5 days, some rooms with evaporation air-cooling and a private ‘bathroom’ (see above) became available and we moved upstairs to luxury. With a fridge! This was borrowed from another room, and powered by shoving the bare wires into a socket…plugs are obviously scarce. Perspectives and standards change. Upstairs – The Luxury View! First impressions of the people here were of genuine goodwilll and friendliness, with none of the hassling or trickery we had become used to in Egypt. The week here has only gone on to expand that feeling of friendliness and welcome – the people making up in a huge part for the inhospitable desert environment. Make no mistake, this a harsh place to live with little in the way of comforts. But life thrives here and the people go about their business with smiles and good humour; they ask where you come from not as a precursor to selling you useless tat or pulling a scam, but because they are interested. Egypt could learn a big lesson from the Sudanese people if this is anything to go by. Maybe we can too. 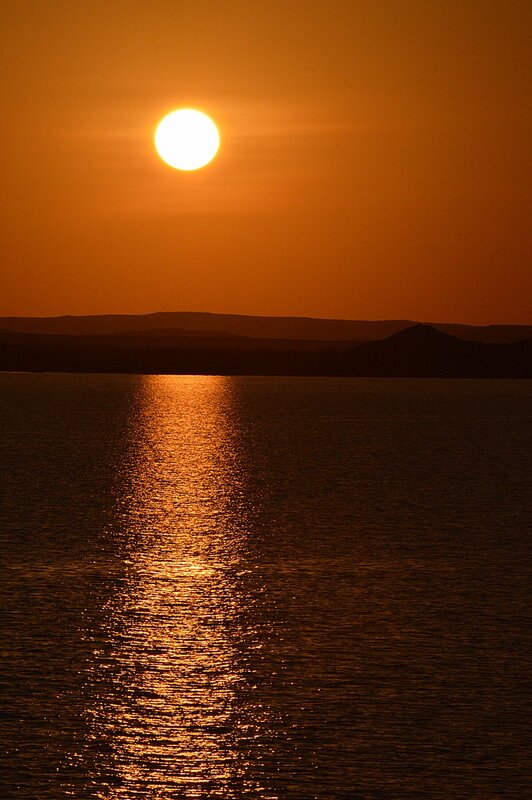 Meanwhile, it is now a week since we arrived and the next ferry from Aswan is due any time now. The barge with Troopy onboard is slowly making its way down the lake and should arrive tomorrow night. In some ways our enforced stay has been like torture – the hotel room for the first 5 days was just an oven we lay in waiting for the sun to go down; we don’t have an unlimited time for the trip and each day spent here was 1 day less for watching elephants or swimming in the sea. But if we hadn’t been stuck here, and instead blown straight through and into the desert again towards Khartoum, we would have missed getting to know these people a little; we would not have been invited round to Mazar’s house for tea and met his wife (and cats) in the tranquility of his walled garden home. It is a deliberate choice here not to follow the Egyptian practice of charging visitors inflated prices, in the hope that more people will come and visit when they understand how honest and fair these people are, and because they just think its the right way to go about life. I really hope that they succeed for their sakes and ours – we really don’t need more charge-what-you-can-get-away-with consumerism in the world. Personally – and I am surprised to say this after my first impressions of this hostile desert environment – but I’ll be a little sad to leave. I do look forward to some more variety in the diet though!